This is a numbered Fleetwood Inaugural Cover bearing an 8 cent stamp of the American flag flying over the White House. 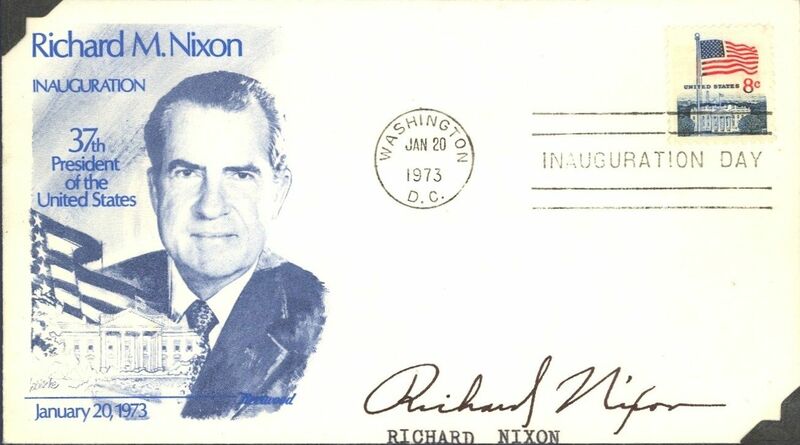 The number stamped on the verso of the cover is: 31486The cover has been cancelled in Washington, D.C. on January 20,1973, the day Nixon was inaugurated. The message above and below cachet: "Richard M. Nixon / Inauguration / 37th President of the United States." Nixon has boldly signed "Richard Nixon" in black ink on the address portion of the envelope. The cachet shows Nixon's face with an American flag in the foreground. Below the cachet is: "January 20, 1973."